Whether it’s a backyard barbecue, a block party or movie night, you can sweeten summer fun and celebrations with an iconic treat. August 10, National S’mores Day, is a great reminder to make the most of summer. This year, consider going beyond the classic S’mores recipe that family and friends have been enjoying for decades. HERSHEY’S is offering some great twists to the season’s quintessential snack. Headed to the neighborhood block party? 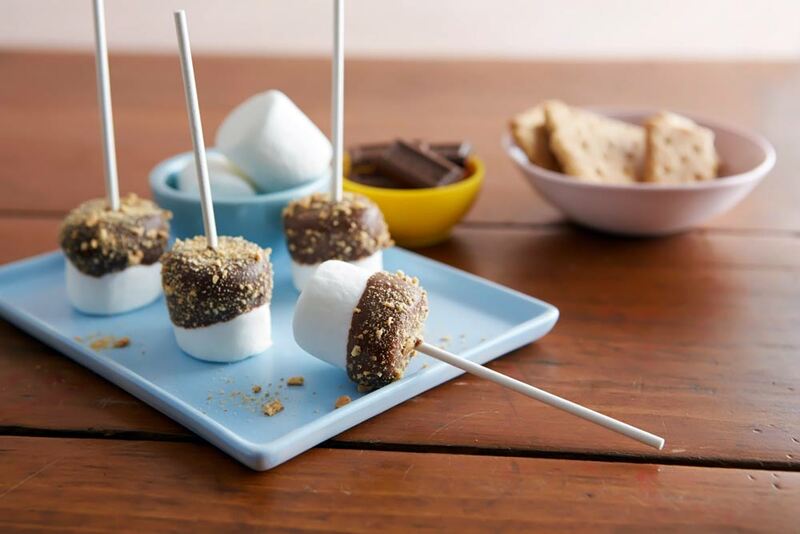 S’mores Pops bring to life all of the elements of the traditional recipe in a newly imagined treat. Line cookie sheet or tray with parchment paper. Remove wrappers from chocolate bars; break into pieces. Place chocolate and shortening in small, microwave-safe bowl. Microwave for 1 minute; stir. If necessary, microwave for an additional 10 seconds at a time, stirring after each heating, until chocolate is melted and mixture is smooth when stirred. Dip about 1/2 of each marshmallow into melted chocolate; shake off excess chocolate. Immediately sprinkle chocolate portion with graham cracker crumbs or dip for heavier coating. Place uncoated side on prepared sheet. Push lollipop stick through top of chocolate about halfway into marshmallow. Repeat procedure with remaining marshmallows. Refrigerate for about 5 minutes or until firm. Store in cool, dry place. Heat oven to 350 degrees F. Line cookie sheet with foil. Lightly spray foil with vegetable cooking spray. Break graham crackers into 1/2 to 1 inch pieces; spread on prepared cookie sheet. Place butter in small, microwave-safe bowl. Heat in microwave for 30 seconds. Add sugar and cinnamon; stir until butter is melted and mixture is blended. Drizzle over graham cracker pieces. Bake in oven for 10 minutes; gently stir or turn over pieces. Bake for additional 10 minutes; remove from oven. Cool completely on cookie sheet. Remove wrappers from chocolate; break into sections. Toss graham cracker pieces with chocolate bar pieces, cinnamon graham cereal, marshmallows and peanuts. Store in cool, dry place. Makes about 4 cups mix. To add a touch of sweetness to summer celebrations, enjoy this treat the traditional way or put a fun spin on an old favorite. For more inspiration, ideas and S’mores recipe variations, visit www.CelebrateWithHersheys.com.